1. PP playmakers – Ryan Merkley and Will Bitten both pick up a ton of points on the power play, but both rely on passing as the most prudent way to pick up those PP points. With the man advantage, Merkley has 2 goals and 24 assists, while Bitten has 2 goals and 21 assists. 2. Lucky Luchuk – Luchuk scored a goal and and added three assists against Saginaw earlier this month, reaching 100 goals, 100 assists and 200 career points for his OHL career in the same game. 3. North Bay has won seven of their last eight games, scoring 28 goals and allowing 18 goals against. That has them back at .500 and just five points back of Kingston, nice turnaround for team that was at risk of missing the playoffs for the second straight season. 4. Sarnia and Kitchener – The Sting and Rangers are both riding winning streaks, but have both been riding shotgun to the Soo so far this season. With all the attention on the Greyhounds, these two teams have been quietly playing some very solid hockey. Going to be a great second round series if it plays out that way . 5. King Kyrou – Jordan Kyrou is back on top the OHL scoring lead, since WJC return 4g 11a is 5 games, leading the OHL with 2.0 points per games. You’d be hard pressed to find a more dominant offensive player in the lead right now. 6. Red hot Frost – Morgan Frost was leading the OHL and points, and has a commanding lead as far as plus-minus is concerned, with a whopping plus-47 rating, his linemate Boris Katchouk is second at plus-33. Recently had a 20 game point streak snapped, where he scored 16 goals and added 27 assists. 7. Repeat Rookie a rare feat – Could there be another rookie of the year in Guelph? Cam Hillis leads all rookies with 39 points. If he wins rookie of the year, him and Ryan Merkley would be the first teammates to win the award in back-to-back seasons since Patrick O’Sullivan and Rob Schremp did so in 2001-02 and 2002-03. It’s only happened one other time, John Goodwin and some guy by the name of Wayne Gretzky won it with Salt Ste. Marie in the late 1970’s. Barrie’s Andrei Svechnikov is likely Hillis’ stiffest competition, but has played 20 less games. 8. Where’s the love for freshmen goalies? While we’re on the subject of Rookie of the Year, only one goaltender has ever received the honour, Bruce Dowie won the award in 1979-1980 while with the Toronto Marlboros. Although, there is a separate award for the rookie goaltender with the best GAA at season’s end it’d be nice to see a netminder recognized as top rookie atleast once in almost four decades. 9. 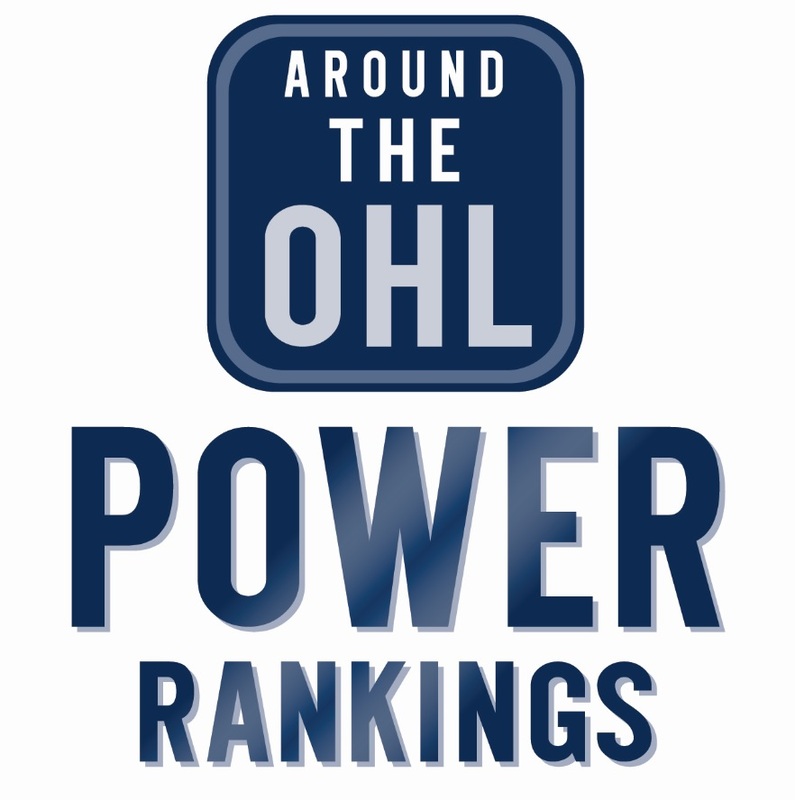 ‘Hounds with 2 rookies in top 10 – Ok, one more note on rookies, Sault Ste Marie has two players among the top ten rookie scorers, Rasmus Sandin (5g 23a) and Ryan Roth (10g 13a). Still a far cry from the Greyhound rookies of the 1970’s where a Sault Ste. Marie player won ROY four out of six seasons. 10. Miletic didn’t miss a beat – Sam Miletic was traded from London to Niagara at the deadline, and he was playing some pretty good hockey when the trade game. He was coming off three straight three point games when he was dealt, his first two games in an IceDogs’ uniform were also three point efforts. Miletic is averaging more than an assist per game this year with 38, impressive considering he had just 29 assists the two years prior, to go along with 40 goals. 11. Evan Bouchard – The newly named captain of the London Knights, and prospect for this year’s NHL draft, Bouchard leads all defencmen with 54 points, 15 of those are goals. He’s currently second in the OHL in shots, that’s including forwards. Dmen with the ability to get their shots through traffic are worth their weight in gold, we’ll see which NHL team scoops up the third year blueliner. 12. Drake Rymsha – What a sneaky pick up by the Sarnia Sting last season, and he’s been great since, with 42 goals and 88 points in 74 games with Sarnia. This season he’s also won 65.7% of face-offs he’s taken. 13. Shootout Shutouts – Luke Richardson, Evan Cormier and Kai Edmonds have all been perfect in the shutout this season, not allowing a single goal against. Joseph Raaymakers was on the list until London lost in a shootout to Luke Richardson’s Kitchener Rangers this week, he’s stop six of seven attempts. Tags: Drake Rymsha, Evan Bouchard, Jaker's Dozen, Jordan Kyrou, Kitchener Rangers, London Knights, Morgan Frost, Niagara IceDogs, Sam Miletic, Sarnia Sting, Sault Ste. Marie Greyhounds. Bookmark the permalink.